Although the lemon begins to blossom as a young plant, it will bringfruits after a few years. 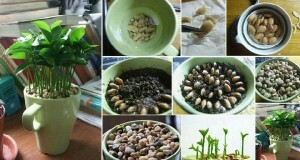 Did you know that you can plant a true lemon tree in a cup? Choose the largest seeds of lemon or grapefruit. Clean them from their outer skins. Pour it with water and leave it like that for 6-7 days, change the water every day. While soaking, the seeds should be covered with gelatin sheet, this is normal. Put a few stones in the bottom of the cup to create drainage, after that fill the cup with moist soil. The seeds are put in the ground with pointed ends to the bottom, and leave about 5mm space between them. After that, the seeds are covered with coarse sand or gravel. Do not forget to spray the surface with water, 2-3 days. You can cover the cup with nylon bag or foil, whit which you will create a greenhouse effect. Continue to spray with water once every two days, to support their growth. For 7-8 days the first shoots should appear. If a lot of shoots appear, you can carefully transplant them into another container. So they will not be too close. After 3-5 months, when the seedlings are grown, you should choose the most beautiful and the strongest ones, and transplant them into individual pots on a larger diameter. Thecomposition of thesoil should remain the same. 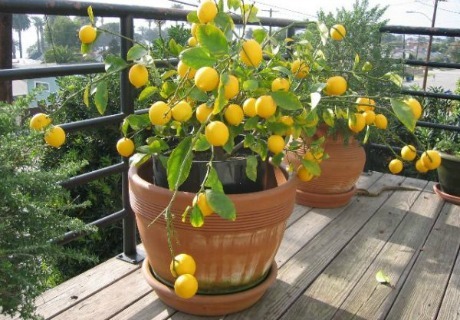 If you have a garden, you can place the lemon in the ground together with the flowerpot on a sunny place. In winter, lemons love bright and fresh rooms, of course, without ice. Water it moderately in winter, but do not allow the soil to become completely dry. Ifpart of the leaves drop, there is no need to worry, this is normal. In the spring cut off the brunches, and for a very short time newbrunches will grow and there shall be a beautiful bushy crown. However, do not expect from the trees to grow fruit if you do not graft it, but with good care it can become a very beautiful and luxurious house plant. The lemon likes to take a shower. In the summer it should be watered, fertilized with nutrient citrus and it would be preferable if you put it on fresh air.